UPDATE 2: The Instant Pots are again available for these prices, with the best deal probably being only $80 for the popular 6-quart Instant Pot. 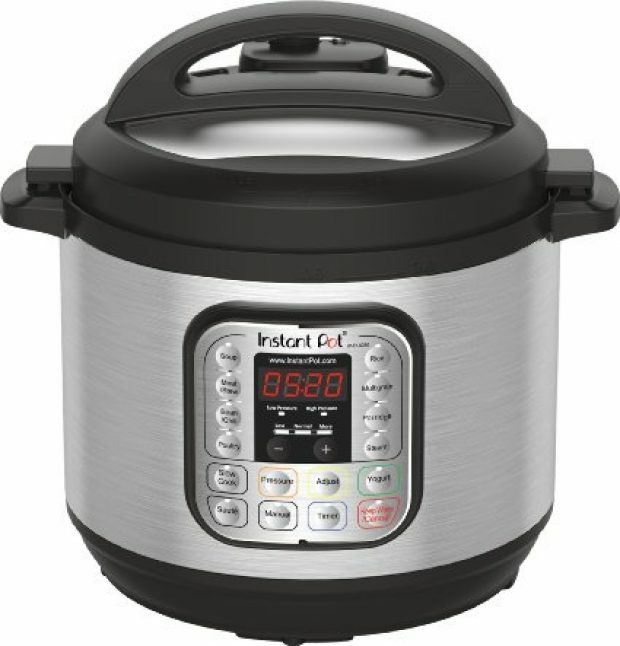 UPDATE: The very popular 6-quart Instant Pot is no longer available at the deal price listed below. The Daily Dealer will keep an eye on it and let you know if/when it ever is again. Out of all products we have referenced at the Daily Dealer, none has been as popular as the Instant Pot. Our readers love this 7-in-1 smart appliance, which has “the functions of pressure cooker, slow cooker, rice cooker, steamer, sauté, yogurt maker & warmer.” It makes cooking faster, more efficient and, above all, just plain easier. And right now the 8-quart model is $50 off. The Instant Pot has a 4.6-star rating on Amazon; over 18,000 of the nearly 22,000 customers who’ve reviewed it gave it a perfect 5 out of 5 stars. Let me put it this way: your kitchen could use an Instant Pot. Note: the 8-quart model is $50 off, and the 6-quart model is $20 off. That means the 6-quart model is available for just $80. Wow. The holidays must be coming up for deals to be this good.